Oh, Hitchhiker! How do I love thee? I can’t begin to count the ways. The Hitchhiker shawlette has got to be one of the most wearable handknits ever. I know because I made one several years ago that I wore and wore and wore until I gave it to my mother, who has worn and worn and worn it! It’s the most wrap-able, tie-able, drape-able piece of knitted fabric you could ever hope to have. And the Malabrigo “Archangel” absolutely soothes my soul. I love it. This particular Hitchhiker will always remind me of this crazy first semester back in the classroom after so many years. Each row represents a moment of calm–before bed, between classes, during the frenzied lesson preparation that has been the constant theme of the last few months. It saw me through a bout of doctor’s visits. It helped me find calm as I anxiously awaited a friend’s visit and sustained me when I was sad after she’d gone. How on earth does knitting do it? All of this? If anyone knows of another scarf or shawlette pattern that compares to the Hitchhiker in terms of its perfect suitability to every occasion, please let me know. I need it. Last weekend was SAFF, the Southeastern Animal Fiber Fair, in Asheville. It’s a huge good time. Fabulous vendors, animals, knitters, weavers, fiber people of every sort are there. Last year, I had to miss it, so this year, despite the crazy busyness, I was determined to go. Plus, I got to meet an online fiber friend (and her dog!) in person, which was a delight, and grab some actual face time with a few of the nearby fiber friends I’ve seen precious little of over the last couple of months. And of course I bought some yarn. I’ve been dying to jump on the “fade” bandwagon but wasn’t up for the epic bigness of the Find Your Fade shawl at the moment. Happily, my BFFF Cari alerted me to the Free Your Fade a few days before SAFF! So that’s what I had in mind when I went yarn shopping. What do you think? It’s Dragonfly Fibers DK weight Traveller. The squish is real. I also picked up some buttons. Love buttons. Cardigans are in my future. Tomorrow, it’s back to class, but I’ll be sporting my trusty Hitchhiker. Happiness. My apologies for the disjointedness of this post. My brain is in a million places. I’m off to read some of the sure-to-be-wonderful blog posts I’m behind on before I turn in for the night. I hope you are well, my friends. Take care, and knit on. Plus, this time I was knitting with Hedgehog Fibres yarn, and the colors reach right down into my soul. “Poison” and “Ruin.” Lordy. And look at the wrap and the drape. Every way I fling this shawl around myself it stays put. Some of the commenters on Ravelry mention that they don’t like the drawn-in top edge, but I think that’s one of the things that makes it so wearable. It gives it just enough structure to help it hold on around your neck and shoulders. I’m not planning to knit a third The Rain Outside right away, but I’ve got it in my mental inventory now, and some day, it will be just the thing. I’m thinking my next shawl might have to be a Find Your Fade. By the time I get around to it, I’ll be the last person on the planet to knit one, but oh well . . . It’s not a race, right? I still haven’t knit a pair of Hermione’s Everyday socks, and that hasn’t killed me. Yet! On an entirely different note, I’m thinking about a redesign for the blog. What do you think? Do you like it when a blog you’ve gotten used to changes its look, or do you prefer for things to stay like they are? I’d be interested in feedback if you have it. Life has been especially lifey lately. As a consequence I’ve found it necessary to cast on many things. Well, just three things, but that’s two beyond my comfort zone, especially since I still have a couple of UFOs in the wings. The first cast on is something I actually mentioned a couple of posts ago but haven’t really talked about. It’s Jane Sowerby’s Spider’s Web Shawl from the book Victorian Lace Today. Here is a picture, but you can’t tell much. It’s destined to look like a blob as long as it’s on the needles. This is the most challenging lace project I’ve ever attempted. 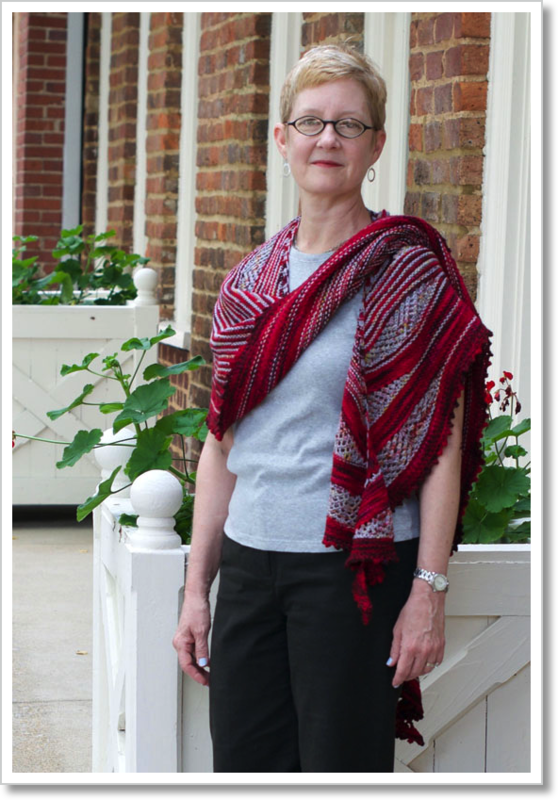 A couple of years ago, I knit Hilary Latimer’s Mystery Knit Along Shawl and loved the way the painstaking, careful work of knitting it actually turned out to be very relaxing. I had to pay attention so absolutely that when I’d come up for air it was almost like I’d spent the time taking a rejuvenating nap. My mind would be clear, and I’d be refreshed and ready for whatever was next. I’m hoping the Spider’s Web Shawl will give me a similar experience, but I’m not quite far along enough to tell. The thing that motivated me to attempt this pattern was actually the yarn. The yarn I’m using is an airy, soft, almost luminescent, lace-weight, mostly mohair blend that came from a couple of very special goats we know. We met Gracie and her brother Reuben when they were babies. They belonged to our dear friend Marcia who runs Good Fibrations. Somewhere I have a picture of Paul holding Gracie the day we met her. I think she was only a week or so old at that point. It’s insanely sweet, and if I ever find it, I’ll show it to you. Anyway, Gracie and Reuben now live with our friends, Ann and Trish, over at Out in Jupiter Farm. Here’s Paul with Gracie at their place last year. Ann and Trish took the fiber from Gracie and Reuben’s first shearing and turned it into an out-of-this-world laceweight yarn, and that is the yarn I’m using for my Spider’s Web Shawl. I’m hoping to do it justice. I’ll keep you posted. So that was the first wild-hair cast on. Remember the Inlet cardigan? It still has no sleeves. I just wasn’t in a sleeve knitting mood, ya know? The Spider’s Web Shawl requires concentration, and it’s gotten too warm to work on the Zigzag Blanket, so there were some knitting opportunities cropping up when I didn’t have anything to knit! Cast On #3. This one isn’t actually on the needles yet, but that could happen any second. I’ve got the yarn. I’ve been dying to knit with some of the wonderful, speckledy Hedgehog Fibres yarn I’ve been seeing everywhere, and after I knit The Rain Outside for Cari, I knew the next one had to be for me and that I had to get myself some of that yarn. I chose “Poison” and “Ruin.” What do you think? And just in case the cast-on frenzy isn’t over, I ordered the two skeins of “Sangria” at the top of the post. I’m so not sorry. *Father John Misty’s Funtimes in Babylon has felt relevant lately. Paul’s Checks & Balances sweater is off the needles! I wrote about the Good Fibrations yarn I used for this in an earlier post, and I simply cannot praise it enough. Knitting with it made me think back to one of the first sweaters I ever made. That sweater was a cardigan, and the yarn I was using was a worsted tweed of some sort. The feel of it was full and soft and sturdy, all at the same time. It was like a lullaby in my hands, and it carried me off to a sweet, sweet place whenever I picked it up. Honestly, I think knitting with that yarn, all those years ago, is one of the reasons I became A Knitter. And this yarn is like that. Plus, it’s gorgeous. The colorway is called “Soft Suede,” and it goes with just about every pair of pants Paul has. One consideration when I was choosing a pattern was that the sweater needed to be sturdy and not prone to losing its shape. Paul is pretty hard on his clothes, and I wanted this to be something he could wear without having to worry about stretching it out or messing it up. I decided to go with a design knit in pieces and then seamed, hoping that the seaming would add a little more structure to the sweater than it might have otherwise, and that definitely turned out to be the case. He should be able to knock around in this day in and day out without any worries. It makes my heart swell to think of my honey wearing the sweater I knit for him, with all the love and care that went into it holding him close. I don’t do a ton of knitting for other people, but every time I do, I’m reminded what a special gift a knitted thing is. The person who gets it and the knitter who knitted it both come away with so much. I have one other random picture I’ve been meaning to show you–the Mystery KAL Shawl in the wild! A friend took this snapshot of us at a wedding recently. The shawl was perfect because the wedding was in the evening, and it was held outside. The temperature was in the seventies when we got there, but by the time dinner and dancing wrapped up, it was in the mid-fifties. I started out with the shawl over my arm, but by the end of the night, I was using it to keep me warm. Hooray for handknits in action! There’s an interesting article about Yarn: The Movie here. Since things are feeling a bit insane around here workwise, I will make no mention of my own knitting projects today. Instead, I want to tell you about the explosion of blog serendipity that happened yesterday. I was catching up on recent posts from my favorite blogs and intending to keep a tight rein on my habit of following links down rabbit holes, but darn it if Fiber and Sustenance didn’t draw me in with a picture of stripey socks and desert boots. I accidentally kept reading and was reminded that she and a friend were doing a hap KAL and that I’d wanted to check out said friend’s blog over at Rosalind Craft Supplies. Well . . . Kate of Rosalind Craft Supplies posts lots of pictures of books and knitting against which, it just so happens, I am powerless. Ten or fifteen happy minutes later, I got ahold of myself but fortunately not before I’d discovered this awesome video that Kate shared in a post about her pick for the Top Nine Television Knitters. I LOVE this guy. And it turns out he actually did finish the bow tie! So anyway, determined to avoid future detours and stick to the essentials, I stopped by alexand knits. I had several posts worth of catching up to do, and wouldn’t you know it? There’s this post about how Alex’s friend Carol of knit equals joy gifted her a sock pattern. That led to my checking out both Carol’s terrific blog (awesome, awesome photos!) and the sock pattern, Susan B. Anderson’s Smooth Operator Socks. Well . . . it just so happens that there is a KAL starting for the Smooth Operator Socks in Susan B. Anderson’s Ravelry group, itty bitty knits. You know what that led to, right? But not really. See, in the same post where Alex mentioned the Smooth Operator Socks, she talked about a Wolfberryknits post and said it was really worth checking out. Oh. My. Heavens. Check THIS POST out! It’s the best thing I’ve seen on a blog in ages. It’s about taking local fleece and dyeing it with dyes made from local plants, and spinning it, and knitting it into a glorious pair of 100% Australian socks. There are tons of pictures, and the socks are insane. Should I mention that as I was reading the comments on the Wolfberryknits post (I told you it was bad) I came across this sentence: “I have always been attracted to shiny things. I am a life experience magpie who wants to know how things work and who collects processes like other people collect random paraphernalia.” You know I had to find that person. Turns out, that’s narf7, and her blog is Serendipity Revisited. And yes. It’s an extremely cool blog. What better way to kick off the 4th of July weekend than by casting on for a heavy wool sweater?! Woohoo! Seriously, I’m pretty excited. I started Checks and Balances for Paul. I’m using one of my absolute favorite yarns. It’s a mohair/merino blend from Good Fibrations. The mohair is the magic ingredient. It gives the yarn this incredible loft that makes it wonderful to handle, and it knits up into garments that are exactly what you want from wool–light but sturdy, comfy, cozy, hard wearing . . . It’s the perfect sweater yarn. And the color! The artist who raises the angora goats who contribute the mohair is a genius with the dye pot! I posted a picture of a mind blowing red she dyed back in October. The colorway I’m using for Paul’s sweater is called “Soft Suede.” I’m not sure if you can tell from the picture, but in its way, it has as much depth as that glorious red. The best part about Good Fibrations yarn and the very special woman behind it is the goats themselves. My friends, these are happy, happy goats. These pictures are from a visit to the Good Fibrations farm during kidding season. I think that’s what it’s called. It’s the time when there are goat babies everywhere! I cast on for the sweater last night and knit a bit here and there as we ran errands today. I found a shady spot behind the library while Paul ran into the bank. This is going to be a busy weekend, and the Tour de Fleece starts tomorrow, so there will be lots of spinning for the next few weeks. That probably mean progress on Checks and Balances will be slow for awhile. That’s okay. I’m happy to have gotten started. Happy 4th of July weekend, everyone! I hope you get to spend it doing the things you love. Guess what happened. I was knitting the very last of the shawl collar short rows on Gramps on Friday night, and I ran out of yarn. During a break in our ongoing Lost marathon, I jumped up to grab another skein, but crappity crap crap crap, there was no more Lorna’s Laces Shepherd Worsted in “Echo” . . . anywhere. I always always always order more yarn than I think I’ll need, so I was sure there had to be some somewhere. Stop the Lost marathon, stop everything while I spend the next half hour searching for the missing yarn until I come across the original receipt that shows I only purchased—yep, ONE skein of “Echo.” Damn. Remember how I was thinking of doing a quick sweater with seamed sleeves as a test for Paul’s sweater? Well, it’s underway. I’d ordered some bulky yarn already in anticipation of doing this. I got it for $4 a skein on sale at Jimmy Beans a few weeks ago! It’s Crystal Palace Danube Bulky in “Robin Hood.” It’s a nylon/wool/rayon blend. That’s not something I’d normally choose, but the $4 price tag got me. And you know what? I’m really enjoying knitting with it! I think it’s going to make a great lightweight sweater that will transition through all but the warmest weather. I found a pattern in this book. It’s a plain old straightforward pullover which has the construction I wanted, so it’s perfect for my purposes. It’s been just the thing for Lost watching, super-busy-week-managing knitting. I should finish up the back and be on to the front today. Woohooo! !